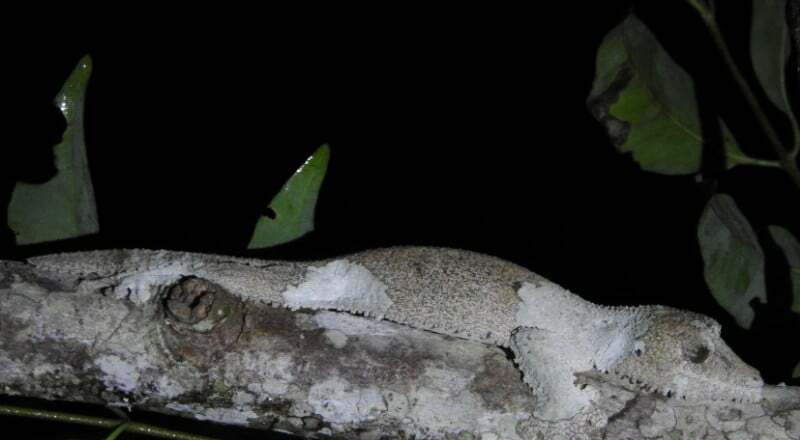 But this mossy leaf-tailed gecko takes the cake. I saw it tonight on our night walk outside Andasibe-Mantadia National Park. But I wouldn’t have seen it at all if our guides Florent and Jean-Rémi hadn’t been there with decades of experience searching for the hard-to-find creatures of this rainforest. From more than a few feet, or if you angled your flashlight the wrong way, this gecko looked like a bump on a log. And when we looked at it head-on, many in our group couldn’t see it at all. It’s colored just like tree bark. See those hairlike protrusions on the bottom of its jar, limbs, and chest? Those help it blend in even further by visually blurring the border between its body and the tree.